As useful as 3D printers are becoming in industrial design, they still aren’t exactly eco-friendly and are still mostly limited to small scale objects. 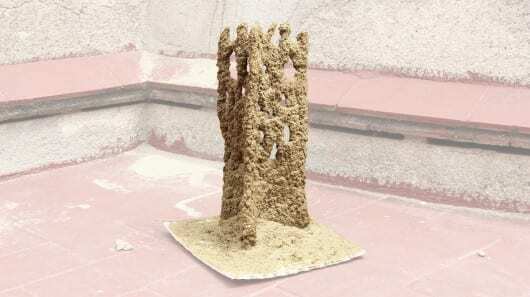 You couldn’t really use one to print a building just yet, but a group of architects may have taken a step in the right direction with a new machine called the Stone Spray. Using natural soil and sand, the Stone Spray can construct intricate solid structures at almost any location, even on vertical surfaces. The device was developed by architects Petr Novikov, Inder Shergill, and Anna Kulik as a research project to experiment with applying the concepts of digital manufacturing to construction work. The Stone Spray works much like a 3D printer, since it follows a 3D design from a computer and creates objects by layering material. It’s main distinction though is that instead of using a synthetic material like plastic, the machine uses natural soil or sand mixed with a solidifying agent. Living up to it’s name, the Stone Spray’s mechanical arm literally sprays the concoction from a nozzle to slowly build scaled down towers and arches. Once it’s dried, the resulting creation resembles a chunk of corral but is as solid as concrete. Aside from the material it uses, the Stone Spray also stands out for its ability to create forms that most other 3D printers cannot. The majority of 3D printers can only build upwards, as layers of material are stacked on top of each other. The Stone Spray on the other hand can build in almost any direction, creating multi-directional arcs and even constructing outward from a vertical surface. Certain designs aren’t solid enough to stand on their own during production, but these can still be made around a wire framework.